Title: The New Gospel of Christian Atheism Author: Thomas J. J. Altizer Philosophical and Cultural Studies in Religion Imprint: The Davies Group, Publishers soft cover 166 pp. 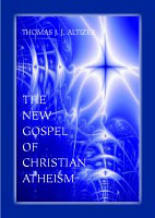 US $20.00 ISBN 978-1-888570-65-6 November, 2002 When Thomas Altizer’s The Gospel of Christian Atheism appeared in 1966 at the height of a national media furor over the emerging “Death of God” movement (a movement that precipitated a world-wide re-evaluation of the nature and existence of God and inspired some significant contributions to twentieth-century theology) it became an international best seller. Now, in The New Gospel of Christian Atheism, the author undertakes a radical rewriting of that work, incorporating his more recent theological thinking, and addressing our contemporary nihilism. The original Gospel promoted the controversial idea of the death of God to an excited American and international public; this New Gospel articulates the abiding seriousness of that radical theological vision anew, some thirty-five years later, for our age of rapid technological advance and globalization. Here Altizer’s early vision of the 1960s is deepened and confirmed in the boiled-down, essential, distinctive language of his mature years. The consistency of his project across four decades is newly visible in this New Gospel for our day. Contents Preface Chapter One — The Uniqueness of Christianity: Religion, History, Death Chapter Two — Jesus and the Incarnation: The Name of Jesus, Self-Emptying, The Universal Humanity Chapter Three — God and History: Dialectic and Theology, The Christian Name of God, God and Satan Chapter Four — The Self-Annihilation of God: The Death of God, Atonement, The Forgiveness of Sin Chapter Five — A Calling: The Body of Christ, Absolute Nothingness, A Call Index Author Thomas J. J. Altizer is a native of Charleston, West Virginia. He took his PhD at the University of Chicago and is presently Professor Emeritus of Religious Studies, The State University of New York at Stony Brook. Altizer can be characterized as the most radical theologian of our age: a major exponent of the death of God theology, and the only theologian who has constructed a full and comprehensive radical theology, one grounded in the Bible, our imaginative traditions, modern dialectical philosophy, and a Buddhist horizon.